Last week, we turned our house upside down. Almost literally. In a matter of one morning, we uprooted everything in our family room (which housed all of our children’s toys, DVDs, some books and random other things), our entire downstairs storage (boxes upon boxes, whose contents we had long forgotten), and our “messy” room (an office-like room that was a catch-all for things without a proper home). A week or two earlier, I had also dramatically cleared out our family closet, main bathroom, and kitchen in similar fashion, inspired by Organized Simplicity. Next, we purged. And we were brutal. Didn’t love it? Gone. Couldn’t remember the last time we used it? Gone. Somewhat broken and not particularly important to us? Gone. None of the children were especially attached to it or used it regularly? Gone. It felt like half of what we owned, though I’m sure it wasn’t close. We left the bulk of the furniture alone, that wasn’t the issue. It was all the other stuff. When did we get so much stuff? Did we even know all the stuff that we had? If we took this box or that box from storage, would we even miss any of it? I wish I had taken pictures to show you (but I was actually ended up sick with the flu during much of the process- my husband is truly amazing to have finished it himself!). We filled our entire minivan almost 1 1/2 times with things to bring to the thrift store and the dump. We don’t think we’re done, either. There are a few rooms that need some more attention yet. Not to mention that once we started, it became so freeing to purge that we almost don’t want to stop. Since everything vacated the premises 48 hours ago, we can’t stop commenting on how peaceful the house feels. We’ve lived here for almost a year and a half, but only just this weekend it began to feel like our home, instead of just a place where we live and keep our stuff. One of the best parts of it all? Our family/play room had been driving me batty since we moved in. I had such a hard time encouraging the children to keep it tidied and I often cleaned it myself after they went to bed, out of sheer frustration. It overflowed into our dining room and kitchen and toys were often scattered all over the house. It was discouraging to say the least. Our solution for the toys? We moved the large oak shelves that held all of the children’s bins and baskets of toys down to our basement storage area (where they are not allowed to play or go without permission). We got rid of the large toy box that held all of the odds and ends and contributed much to the mess. All that we kept upstairs was their wooden play kitchen (empty), a wooden stroller/cart, a few stuffed animals, and our son’s train table (in his bedroom). We put everything back into organized containers and baskets, downsized due to the purging. And we put them all downstairs on the shelves, out of site. We bring one bin up at a time, and rather than getting quickly bored, we’ve noticed them engaging more thoroughly and getting bored less quickly. Clean up is a snap. I simply say “put the toys back in the bin”, which is infinitely less overwhelming to young children than “please clean up the playroom”. There isn’t much mess to spread, so it stays contained and the other parts of the house remain tidy. Ahhh. Do We Own It or Does It Own Us? As we drove home from a family dinner last night, my husband commented to me that even though he hadn’t felt that we had a lot of stuff (and compared to many North American families, we probably didn’t), he didn’t realize that it had owned us in many regards. Stuff is funny like that. When you have it, you have to store it, care for it, use it (or tell yourself that you’ll use it at some point), clean it, carry the weight of it. There is a mental, physical and emotional price to the things that we own. For us, it feels good to be back in control, owning our stuff, instead of continuing to let it own us. What’s the status of your stuff? Who really owns who? This was well timed for me. We just moved our master bedroom to the basement, the kids into the master bedroom and we are making the kids old room into a toy room. After the furniture was moved I was stunned by all the other “stuff” that was left. The rest of my week will be dedicated to purging that and organizing what is left. 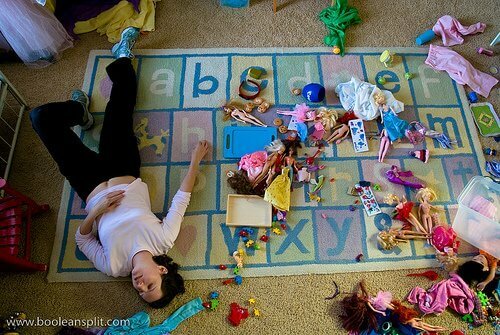 I love the idea of putting most of the kids toys out of site. Their new toy room has a closet that I might just put most of the toys in and just leave the bigger stuff (kitchen, craft area, book shelves) out. Great idea! This is so timely, again. I have a post in my drafts, “Less really is more”. I LOVE purging – I just wish we only had to do it once 🙂 It is SO freeing. Thanks for the kindred spiritedness. Come summer, when pregnancy and new born is not so attached, we will be having major overhaul, sq ft by sq ft! @Sara Shay, It’s probably late pregnancy that is inducing this purging desire, LOL! Nesting, I’m sure. But now my husband is in on it, and we’re just so thrilled we’ve done it. Hope that you get your chance to purge away this summer, too! I love the purging!!!! I’ve started keeping a box in my hall closet just for goodwill. As I come across stuff, rather than put it back in the closet and think “I’ll deal with it later” it goes to the good will box. When it’s full, off it goes and we start another box! Excellent post. I am in the process of also going through the house room by room getting it organized before our newest family member arrives this spring. The last room I tackled was my daughter’s. One of her chores every morning is to straighten her room. Recently, the task had become overwhelming because there was just too much stuff in her room to keep under control. I began by moving the shelving unit downstairs and then her books and toys, since that is where she usually plays with them anyway. By minimizing what was left (her bed, nightstand, dresser, her doll bed and dolls) she has felt more at ease and I’ve noticed that she is resting better at night. I know that our God is a God of order and I believe that when we strive for orderliness in our lives, it has pay-offs in many areas. I implement this same toy system…problem is we don’t have a basement. My toddler got into the bins….it was a mess. Reminder…when it is too quiet go check in on the kiddos…stat! This is such a great post. You’ve got me thinking about what more I can do to declutter. It was actually my New Years resolution this year to declutter, and I have given quite a lot of stuff away to our local Salvation Army store and our church for its regular garage sales. As I’m a stay at home Mum, I’ve also made a conscious effort this year not to buy many clothes. I figure I will get more wear out of the ones I’ve already got if I don’t keep upgrading them. Sometimes I get sick of the old gear, but if I look at it objectively, there’s actually quite a lot there. I think it’s a mindset thing to always want something new to wear. Regarding the house, I think our basement could do with a big clean out to make it a useable space. We’ve been in this house for a year now, and the basement is still full of boxes we put there when we moved in. Our office is the other attractor of all other things we don’t use often – mostly my craft supplies, which I need to sort through. Hmm, not long to go till the year is finished. I’d better get cracking with the rest of this decluttering so I can put a big tick next to my New Years resolution. I would love to hear more about how people are handling gift-giving holidays like birthdays and Christmas or Chanukah. I’m working at the purging and have a long way to go. My kids act like I’m getting rid of their most precious things when they haven’t touched them in months. Talking to them about it has not been helpful either. So what do you do with all the gifts and such that kids bring home and take over the house? How do you manage the input after you increase the output? If it was really getting that serious that they were getting lots of new stuff and never giving up old stuff, then I would make a firm rule that for every 1 or 2 new things that come in this year, 1 or 2 things have to come out (maybe start with 1 thing out for every 2 things in?). I would just lay down the law and expect them to be unhappy about it. But I think they would also get over it. Even though they don’t like it, they have to be taught that they can’t hold on to things forever, or have ridiculous amounts of toys. There still has to be respect in there, letting them choose which ones they keep and which go, and sticking firm to exactly what we said and not expecting them to give up more than that. I do talk a lot with my kids about needing to get rid of things when we don’t use them or they are broken, or when we simply have too much so that someone else can enjoy it. Occasionally they put up a fuss, but since we talk about it often and they’ve had to do it multiple times, it seems to get easier as we go on. I don’t ask the 2 year old, either. I just choose for her, and let the older ones have a say. Love this! We have been talking about this lately and working more and more on simplifying. It’s been over a year since we dramatically downsized, going from an almost 3,000 sq ft house (for the two of us) to a small home 1/3 the size. When we moved, I had three HUGE garage sales, sold stuff on CL and donated 4 SUV-loads full of stuff and STILL didn’t fit everything into the largest moving truck, plus 8′ UHaul trailer. Absolutely ridiculous! My, how things have changed, in a year. We’ve discovered that now, even in 1,000 sq ft, there is ample space, including some that we could downsize even further. I am anxious to get rid of more “stuff” and streamline our daily routine. It really is freeing…and addictive! Thanks for the reminder. If you haven’t seen it, I find The Story of Stuff (www.storyofstuff.org) to be highly motivational. I’m in the process of organizing my home now! You’re right! The more you do, the more you want to do! I take it one closet at a time so it’s never overwhelming. That was my problem in the past. There was just too much to do so I didn’t do it at all. Great post! My sweet husband did a quick but thorough tidy of the front room while I was at a church meeting, in anticipation of an out of town guest’s visit yesterday. OH, what a joy to sit down at my desk without clutter everywhere around me… now, to tackle the laundry basket of STUFF he pulled off. 🙂 Mine, his, four kids, two businesses… it’s a lot of stuff. I adore purging (my happiest memories of pre-marriage life revolve around the thought that I used to tailor my belongings to fit into whatever I was driving!) and just breathing in the space. I think I’ll purge the utensil jar, and then the knife drawer. They’re small things, but cluttered, and smoothing out the space helps on a multiple-times-daily basis. I love your idea, but I’m not great at being able to just get rid of stuff. I usually have to get my husband involved when I get really beyond help in that area and ask him to just get rid of stuff because I can’t. He’s really good at accepting the challenge. I read somewhere about it being a control thing. Not sure about that. Anyway, I have to ask about your sparkling, wood floor. Do you know what kind of flooring it is? 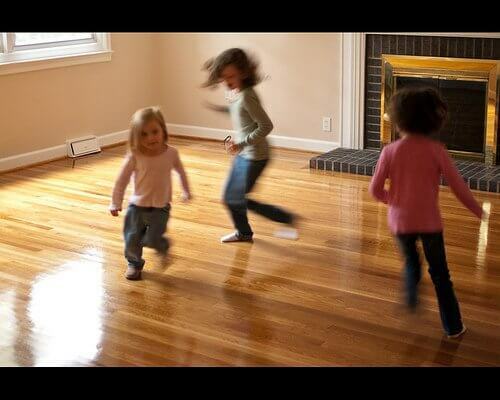 We are looking to put down wood floor in our living area and I really like that color of wood. It looks like honey oak maybe? It needs to be durable. Way to go! Doesn’t it feel lovely? I loooove getting rid of things 😉 But I’m always amazed by the amount of things that build up again. It really is a constant discipline, isn’t it? Purging is something I’ve gotten much better at since too much stuff drives my husband crazy, but it’s something I still need to get better at. I have two things to say on this subject. First, wives, respect your husband in this. If you like “stuff” but he doesn’t, try to change for him. I didn’t change for a long time and it put a strain on our marriage. I know now that whatever I can part with will make him a happier man, and therefore give us a happier house. Second, is a question. What do you do when one of your children won’t give up anything? I mean in a serious way, close to hoarding. This is something we have been confronted with in the past year. I’m sure there are others of you who have had this situation and I’m wondering if you have come up with any solutions. Yes, yes, yes. I personally HATE toys, as I see that they hinder creativity. BOOKS are my problem, though. How do I cull them? We LOVE books, but they are taking us over, and we have a horrible library system in Cherokee County, Georgia, as of Winter 2011-12. Please help! maybe try having a book swap with some of your other mommy friends. everyone brings the books their children have lost intrest in and for every book you bring you get to take a different book home. What a great idea! I am definitely going to start doing this! We did the exact same thing with our girls’ toys about 6 months ago. I got so tired of their room being a mess, that all of their toys were organized into bins and put in the basement (they are also not allowed down there in our house). They are allowed to play with the toys in one bin at a time and have to put everything back before exchanging it with another bin. It has been SO much easier to keep their room clean! We have found the same results – they enjoy playing with the toys they have chosen much more. It is also interesting to see which toys they play with frequently which have stayed in the basement, all but forgotten. So TRUE!!! We haven’t purged (yet), but we are in the middle of a move from Germany to the US. Our house is pretty empty right now and it’s been so nice. The kids have less to fight over and I have less to clean! Less really is more. My husband and I have already been talking about what we can live without once we get settled in a new home! Love this post. Such great reminders for this time of the year. Less is definitely more. I always feel much more calm and peaceful when our “stuff” is under control and we are living simply. I love this! We are doing the same thing in preparation for putting our house on the market in the spring. We cleaned out 12 (yes, that number is accurate) boxes of toys, books, games, and puzzles that we donated and our kids still have enough toys to fill a good sized corner of our basement. Our children definately suffer from over-indulgent Grandparent syndrome! I imagine this will resonate with every single one of your readers. We started this process a few months ago and got side tracked, but even clearing out two closets felt amazing. We are (hopefully) moving in a few weeks, and I plan to use our packing time as a purging time as well! Thanks for the extra encouragement to do just that! Yesterday, my son (2) made a gun out of duplox then put a crayon in it as ammunition. My husband kept “shooting” out the crayon (and a random cheerio they also found) much to Christopher’s enjoyment. I loved this! I love when he makes his own fun out of anything and everything he finds instead of it being dictated by a bunch of toys. I was reading in Jeanette Oke’s Love Comes Softly series about one of the little boys making pretend animals for his “barn” out of straw. That is a gift I want to give to my son, the room to pretend and imagine using simple things. I think I just might do some more purging! Love this post. I’ve been trying to de-clutter for awhile now. I hate to admit it, but it’s hard emotional work. Even though I’m not an extreme saver, I still have a hard time getting rid of things. (After all, who knows if I might need it some day?) Two questions I’ve been asking that help are: 1)Does this make my life better or worse? and 2) Does this help me love God and others or does it keep me from loving God and others? My son has over-indulgent Grandma syndrome as well! We wait until just after holidays and birthdays to clean out his stuff since there is so much! We’re going to try getting rid of as many old toys as they get new toys, to keep the craziness at bay this year. We’ll see if that works! we also have grandmas & papa’s that like to over give to our 2 boys. in the last couple years i’ve started suggesting gifts that aren’t “stuff” like zoo & children’s museum passes or swimming pool memberships. those give us lot’s to DO throughout the year without filling up the toy box. & it’s fun when papa and grandma can come along to enjoy it as well! We’re in this process too (must be the new baby coming for us both, LOL). I realized today I need to set aside a day or two or more (maybe a week?!) where that is ALL I do other than the basic other things. Eg. no homeschooling that week, no extras etc. Just the basic things to keep life running, church, etc. I think then I will be much better off with able to do more better. What did you do with your kids while you did all this? We’ve gotten rid of so much over the years but we need to do more. Its hard to keep it under control. I just wish we didn’t have so much and really we don’t compared to many people I know…but we do compared to most of the world. I find it especially hard because our house is small (well compared to North American standards). I’m further inspired to keep working on it. Glad I am not the only one that struggles with this. My suggestion is, don’t nag. Just do your own things, and see the effect there. He might then see the benefits. Don’t go on and on about it with him. Just be pleasant about it. Don’t touch his things. It will also be in line with what God’s word says to respect your husband to do it this way. I don’t think nagging and pushing etc. has a positive affect on either your marriage or in actually getting a job done. Anyways I hope that didn’t come across the wrong way but just some thoughts. Oh I wanted to add that I also moved my kid’s toys out of sight (in their case, in their bedroom closet, on shelves we installed). We get down one thing at a time. It really helps. Thank you for this post! I have always followed Flylady, but since moving into a new (larger) house last year I have let things accumulate. Now we are moving again and I am feeling overwhelmed with all this…stuff. Thank you for inspiring me to get brutal and get rid of it! I have to say that there is nothing like cleaning out. Getting rid of the things that we don’t use is great! I think, however, that it is easy to hang on to some things because we think we may need it someday. I say if you have to think about it, you probably don’t need it. Now we’ve been working on the mess of a garage, going through boxes & boxes of “stuff” that we’ve even moved 6 times over the past 7 years we’ve been married. I was planning on having a garage sale, but it’s the time of year now that’s not suitable and we’re expecting baby # 4 early Spring….so know I won’t have the time/energy for one then either. We took an entire trailer-full of “stuff” to Goodwill this weekend…..IT FELT GREAT to get rid of so much stuff. We still have more work to do to get our garage organized that way I’d like to see it, but it was definitely a good start! Mostly the kids hung out and watched us and tried to either help when they could, or stay out of the way when big things were being moved. The 7 year old could help quite a bit, the 4 year old just a little. The 2 year old mostly got into stuff, so we tried to do a lot while she napped or was in her high chair, or got the 7 year old to help play with her. Hope you get a lot done before baby! It always feels so good to get it done. Yes, it can be emotional. Sometimes it’s easier to have my husband make decision with some of my things, and vice versa. We tend to cling on to our things for reasons that aren’t really the right ones. I like the questions that you ask yourself. Very helpful! I am going through a similar process, slowly, as we plan to move in less than two yrs. Oh, it’s not my floor, just someone else’s pretty wood floor. 🙂 We have carpet and tile! And that’s definitely not me in the picture! Nor do my daughters play with Barbie dolls! If you know that it’s hard for you, then it’s great to get someone else involved. And for those whose husbands can’t or won’t, then maybe a good friend? I think that makes sense about your daughter’s room and her sense of rest. Our kids rooms are next on the roster, and although we don’t keep very many toys or extras in there, we’ve still allowed them to get clutterer with other stuff. I think they will feel better once we clear them out and make it easier for them to maintain that sense of peace. Stephanie I came back here again for more inspiration (today I cleared out 3 bags of donations, 1 bag of garbage, and two laundry baskets full of papers I took to the recycling depot! yay!) I noticed though that it appears your “reply” function is still not working. Instead of replying under the person’s comment, it just replies as a new comment. So it doesn’t make sense the reply. But I see two spots where it worked correctly. Not a big deal but wanted to mention it. One thing too that I was reminded of today that I thought might help someone here- was that it helps me to have two systems set up- one is for my kid’s rocks (they love to collect them) I emptied a plastic container (clear) with a lid and cleaned it well and they can put as many as they want in there. When its full, they either can’t add more, or they have to get rid of some to add some. Same with all those little things that are “special” to them, some of which I think are good to keep, others not so much…(but I don’t want cluttering all over the place) eg. little clippings from magazines, Sunday school art they can’t part with when the new craft comes home, little pieces of yarn or paper, letters they’ve received, etc…you know, those little things kids like to collect but we think are junk for the most part. Well they each have a shoebox on a shelf we call it their “special things box” and they same thing applies, once its full its full and they have to not add to it or remove things first and get rid of them completely. We go through it once in a while. It really helps me as well to control things this way and they feel respected too I think. You could apply this concept to anything the kids want to collect. Clear bins or containers for stuff they want to see. The reply still wasn’t working earlier this afternoon, but it should be now. Hopefully! I love purging. I just did my bedroom today. It must be the season for decluttering. This idea is genius! I start by moving the shelving unit downstairs and then her books and toys, since that is where she usually plays with them anyway. By minimizing what was left (her bed, nightstand, dresser, her doll bed and dolls) she has felt more at ease and I’ve noticed that she is resting better at night. I know that our God is a God of order and I believe that when we strive for orderliness in our lives, it has pay-offs in many areas. I love to read articles about organizing and purging! I feel I am constantly in this mode and it encourages me to read about others doing the same thing. I got started in a room upstairs that had become our storage (junk) room. I completely took everything out of it to turn this room into a spare bedroom. The hard part was in the getting started. Once I did though, it has gone fairly well. Lots went to the Goodwill other better things went to those just starting out. Some boxes of things I thought to keep…well lets just say I need to go back through those and do more purging. Love your articles…love your ideas…keep writing!!!! Really liked this part. Purging is an ongoing discipline. Wish it could be once and done. thanks for this lovely reminder. we are house shopping and i would like to go through everything before we move so there is less to pack up. Thank you for this post! I like to periodically do this myself but ESPECIALLY right before Christmas when grandparents just can’t help themselves when they buy too many presents! I really wish our living room was large enough for the kids to play in here and keep their rooms only for napping but with the baby’s things in here (including a changing table, swing, and playpen) there just isn’t room. For now. as soon as she’s a bit older and more mobile I can’t wait to get rid of them! I agree with what you said about telling kids to clean their room/play room too big of a task for them because I feel that way too looking at ‘Mount Laundry’ (4 kids 6 and under!) lol. When I get that urge to purge- erm.. purge our ‘stuff’ that is (k made my-self laugh!) I go with it til I’m worn out because I know I always feel so much better in our space after that! I could not love this post more, particularly before Christmas. Just last night I was mourning the avalanche of toys my kids will receive from family, that they will look at and then toss aside as they reach for the next. I started strategizing how to avoid this- like spreading presents out over several days so each toy is played with and enjoyed. Also- a major, ruthless toy purge to get rid of the stuff we don’t love or play with anymore. Really inspiring post! I really appreciated the point about your stuff owning you — when my husband was working in homeless outreach, he said it wasn’t uncommon to meet someone with large bags of things (sometimes just bottles, odds and ends) who would refuse to go to a shelter because they’d have to get rid of it all. Oh, I want to do this so bad! Sounds wonderful. Truly wonderful and peaceful. Hoping to do some of this come January.